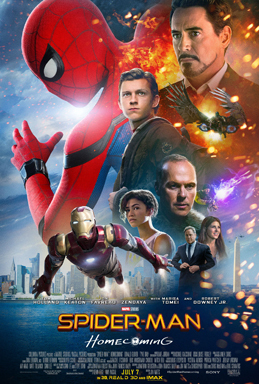 Brief Synopsis – After being discovered by Tony Stark, Peter Parker hones his skills by taking on small criminals in his hometown. His desire to be a world class superhero while balancing his life as a teenager is more difficult than he ever imagined. My Take on it – I wasn’t really sure what to think about this film before IO saw it. I have been a fan of the Tobey Maguire trilogy from the early part of the Century but wasn’t the biggest fan of the reboot with Andrew Garfield. The idea to reboot the characyter once again after just a few years made me question which direction they would go with this. I was extremely pleased at what they did especially with the choice of Tom Holland in the title role. Holland was able to inject so much energy and youthfulness into the character while also giving us the character as a teenager who must deal with both his newfound powers and his attempt to break free of his teenage body, thoughts and of course demeanor. This was something that was sorely missing from the previous two incarnations of the character and was very welcoming here because they got it just right. Loved the way that we can easily compare the fact that they tried to keep the story contained within a small neighborhood while having the character trying to break free of those bonds all the time. This reflects the way that teenage angst can affect someone and it was great watching it happen to a superhero; he constantly wants to be an adult and act like an adult even though he isn’t yet ready for it. Michael Keaton is great as the villain in this film, The Vulture and keeps a mostly calm demeanor in everything that he does the whole way through since he feels that he is doing it all for the right reason. The use of Tony Stark as a mentor to the young crime-fighter works really well and it also helps that they upgraded his suit and abilities. Loved the way that they have created some great characters here and built them all up in a way that we are really interested in knowing how things are being set up for future encounters with these characters. This is one of my favorite super-hero films and ranks among the best of the films in the MCU. In addition, it is also so far one of my favorite films of 2017 and I can’t wait to see this one again. Bottom Line – Great addition to the MCU which injects much needed youthful energy into it all. Holland is a great choice for the title role and is quite enjoyable because he is able to bring a teenage feeling into the role which was missing from all of the previous incarnations of the character of Spider-Man. Loved the way that they try to keep the story itself contained within a neighborhood while the character constantly wants to break out of this constricted environment which also reflects the teenage aspect of it all. Keaton is great as The Vulture and gives so much meaning for the way that he acts the whole way through. They have also done an amazing job setting things up for the future encounters with the characters. One of my favorite superhero films and so far one of my favorite films of 2017. Highly Recommended! I really enjoy Tom Holland for this too.